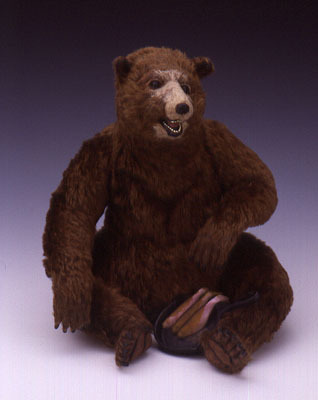 This is a one-of-a-kind soft sculpture bear. His fur is mohair and he sits 12" tall. He has hand sculpted resin claws, glass eyes, and a full internal armature for support. He comes on a base with his cast iron skillet and catch of the day. Ready to ship.